Here’s a chance to kiss a cook – but it’ll cost you. And of course, the proceeds will go to a worthy cause. The Friends of The FCI, a non-profit organization that provides scholarships for students of the French Culinary Institute, will host a "Live Chef Auction" for "dates" with star chefs such as David Chang, Melissa Murphy, Jacques Torres, Jean Georges Vongerichten, and Dan Barber. Winning bidders might land a meal with Jean Georges or a trip to the market with Dan Barber, among other prizes. The auction takes place on Monday, June 11, 7:00 p.m. to 11:00 p.m., at Cipriani, 200 Fifth Avenue. $250/person (646.254.7521). In this case, it would be any one of the Wishbone variety, and before you can even ask how someone managed to "fuse fashion with food" and come up with a "Salad Fashion Show," don't bother -- because someone did. Not to mention, that this is actually the second season for it. So simply go behind the scenes and check it all out at the Wish-Bone Summer Salad Fashion Show this past week, with Project Runway's Tim Gunn, Heatherette, and more. Baguette headwear, and string bean and carrot bodice trims...galore. 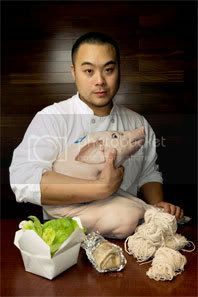 Best noted for making strange, cheap, but mesmerizing food at Momofuku Noodle Bar and Momofuku Ssäm Bar here in NYC, rising star David Chang was crowned as the James Beard Foundation's Rising Chef for 2007 this past week at their annual gala event at Lincoln Center. Momofuku, is known best for its Japanese ramen (noodles)-- by way of a Carolina whole-hog barbecue, with a hint of French technique (thrown in for good measure, of course). Talk about that "smoky hog" pork flavor along with the succulent essence of Berkshire pork bellies. Yowsa. The pork-prone chef artisan's typical "Meathead" cuisine -- at its finest. Grub Street have found the location of the long-rumored third Momofuku here in New York. With no definite time frame, a source close to Chang said that in the near future, a Momofuku Noodle Bar very similar to the current one will open up in a nearby location on Second Avenue, and that the overcrowded original (based on the well-known truism that "mesmerizing foods" keep patrons rolling in for more) will be remade into a fine-dining restaurant. Mega congrats to Chef Chang... and stay tuned. 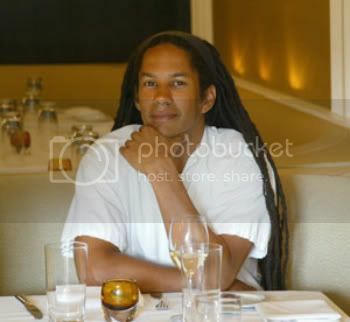 What a success story this chef and consummate culinary master is. And despite his relative youth, he's clearly been in the first-hand trenches of L.A.'s culinary history and cuisine for nearly two decades. Beginning at the age 13, he spent three summer vacations working under the watchful eye of none other than Wolfgang Puck in the kitchen of the original Spago, in its inaugural year. 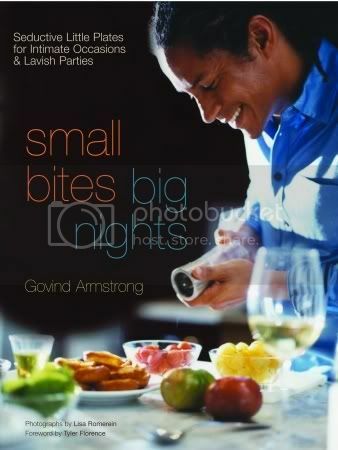 Now, heating up his own kitchen and tantalizing the palates of his dedicated Table 8 restaurant patrons in Los Angeles, Armstrong also showcases his hard-earned pedigree in this new must-have for the cookbook shelves titled Small Bites, Big Nights . Celebrity Chef and AOL Online cooking host, Tyler Florence writes a befitting foreword outlining Armstrong's talents as the king of California-style cuisine, and from hors d’oeuvres to barbeque Serrano Ham and Grilled Endive, to a host of mouth-watering drinks (yes, that Table 8 Creamsicle *is* to die for! ), this one's a true winner.